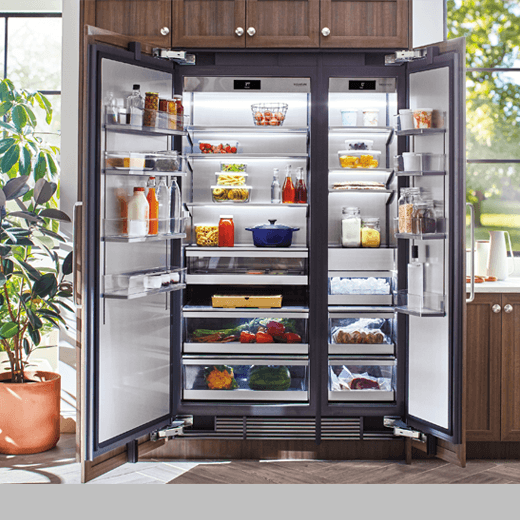 The SIGNATURE Kitchen Suite Column Refrigerator consists of an 18-inch freezer and a 30-inch refrigerator. This modular refrigerator allows you to select its size and type so that it can perfectly fit into a user’s space. In conventional refrigerator designs, the exposed light source and the rear duct hole structure have been taken for granted for the cold air flow and the illumination. However, the SIGNATURE Kitchen Suite Column Refrigerator secures a showcase image and clean look that can perfectly match the modern concept of luxury kitchens.